For many people, the hallmark of a great workout session is waking up with sore muscles. Do you use post-workout muscle soreness as an indicator of your progress? After a strenuous weight-training or cardio workout session, you may feel extreme muscle soreness, exhaustion, and nausea. If you do, you are not alone. This hit-by-a-train feeling that you wake up with following working out is known as delayed onset muscle soreness (DOMS). 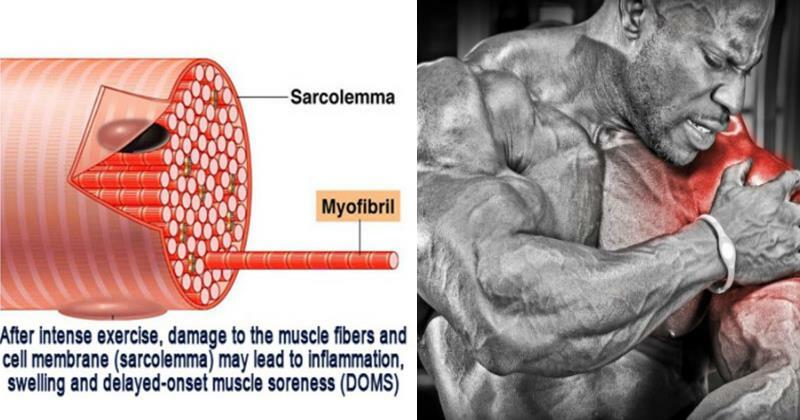 Immediate muscle soreness interestingly dissipates quickly. Delayed onset muscle soreness, however, indicates a natural adaptive process which your body starts after intense exercise. It usually manifests about 24 to 48 hours after an exercise or workout session and decreases spontaneously after 72 hours. Several studies have been done to determine the underlying cause of DOMS. There have been many theories and some of them have been controversial. The most recent research attributes this soreness to microscopic tears in your connective tissue surrounding muscle after eccentric exercise. Luckily, there are several preventative measures that you could take to avoid muscle soreness and deal with it. Stretching is one of the best lines of defense after a strenuous workout. This is because when you work out, your muscles contract and the muscle fibers get shorter. Lengthening muscle fibers after working out can promote mobility, and can facilitate a more thorough and quicker recovery. Stretching can also improve your flexibility. Also, note that before your work out, an effective stretch and warm-up routine will better prepare the body for exercise while reducing the effects of DOMS. Take time to do gentle dynamic stretches [these involve movement] before your workout routine and then follow up with some static stretches. Gentle walking lunges and swinging your legs are two great examples of dynamic stretches. It’s no surprise that water fuels our athletic performance. Hydration is vital both before and throughout the workout to prevent cramping, reduce inflammation, and ease muscle soreness after your exercise session. And despite what a majority of beverage companies would like you to believe, water is the best choice for athletes and fitness enthusiasts. Drinking enough water will help the nasty toxins trapped in your muscles get flushed out much quicker, and the muscles are hydrated to stay supple. In case your fitness or workout routine causes excessive sweating because you’re working out vigorously or exercising in hot weather, replace sodium and electrolytes by drinking a good sports beverage apart from hydrating with water. Just make sure the drink is a low-calorie so that you do not drink back all the calories you burn. Keep in mind that dehydrated muscles become tight and can be easily injured; hence, try to keep your muscles hydrated by drinking half of your total body weight in ounces of water per day. As per a 2014 study, a post-exercise massage could significantly lower pain. Regularly getting massages can also increase the body’s ability to fight off DOMS, especially in the long term. Another 2015 study revealed that massaged muscles have more blood vessels compared to massage-free ones, which can result in better recovery. Also, they display only about half of your scar tissue which non-massaged muscles do. This is not too bad for some low-key me-time. Performing a short cool-down following a workout session helps muscles release excess soreness-producing fluids in your body. In the same way, great techniques like a deep tissue massage or a foam roller will not only help transfer inflammatory fluids out of your muscles, but they can also get rid of adhesions and tight or sore spots from your worked muscles. If you can, try to use a foam roller at least once a week (or after an extremely strenuous workout) and schedule a relaxing massage once per month. Use a reliable telemedicine platform to connect with your physical therapist. He/she can better guide you about deep tissue massage. Multiple studies show that pre-exercise caffeine consumption could reduce subsequent muscle fatigue and soreness. In one recent study published in the famous Journal of Pain, this strategy scored exercising men and women a 48% drop in DOMS. Besides making everything better, caffeine has strong analgesic (pain-killing properties); this is why caffeine is usually contained in many over-the-counter pain medications. According to several studies, the muscle’s main fuel source during a workout, glycogen, is quickly replenished when athletes take caffeine along with their post-workout carbs. An hour before a grueling workout session, drink two cups of coffee. Research shows that coffee hydrates your body which is vital to remember when you are trying to fight muscle pain. Excessive soreness is a reliable indication that you have either increased intensity or volume too quickly in your workout routine, or that you have not recovered properly. That being said, there really is no reason that getting fit and healthy should be painful. Although you can expect soreness when you begin or intensify your exercise routine, you can reduce its effect by recovering after a hard workout, staying well hydrated, and eating healthy sources of protein and carbohydrates after exercising. Therefore, if you find yourself sore after gym, use the incredible techniques in this article for recovering properly and getting fit quickly!